In this email blast: STLHE 2016 Conference, STLHE Annual Reportand General Meeting, STLHE Green Guides, TAGSA and 3M Events at STLHE 2016, Purple Professor, CJSoTL Canada Special Issue, and Upcoming dates and deadlines. STLHE 2016 Conference: The STLHE 2016 Conference is literally only a few days away! The STLHE 2016 Online Schedule is now available by using this link (note that everyone receives a printed program booklet in their registration packets). For up to the minute logistical and presenter information, two Google documents have been prepared that can be viewed online or printed off. They include Preconference information and Main conference materials. See you soon in London, Ontario! other documents will be posted as they become available on the Notice of Meeting Web Page. STLHE Green Guides: Dianne Bateman, Publications Chair, and her Editorial team have been hard at work creating new guidelines for Green Guide submissions. If you have an idea for a new Green Guide be sure to use this link to find out how to get your idea turned into a Green Guide. TAGSA and 3M Fellows Events at STLHE 2016: Use these link to events at the Conference that may be of Interest to TAGSA members and 3M Teaching and Student Fellows. Purple Professor: “Move homecoming to avoid a notorious street party”? What on earth are they on about? Have they forgotten the old joke? “How do you get the neighbors out of your front garden? Move your garbage cans into the back garden.” Move the party and people will attend it anyway: they’ll just move with it. And never forget the old song: “we are, we are, we are, we are, we are the engineers: / we can, we can, we can, we can, demolish lots of beers.” Well, they’ve got to demolish them somewhere, haven’t they? They’ve got a reputation to maintain. Better out in the street than on campus, I say. And you know I’m right about that. SJoTL Canada Special Issue: The Scholarship of Teaching and Learning in Canada: Institutional Impact. The purpose of this special issue is to provide examples and evidence of the ways in which post-secondary institutions in Canada have developed and sustained programs around the Scholarship of Teaching and Learning that impact the institutional pedagogical climate. 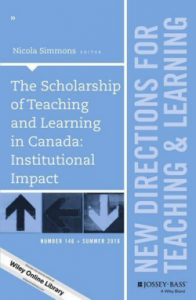 8 institutions across Canada contributed chapters plus the issue also summarizes the history of SoTL in Canada, maps where we are now, and suggests where we might go next. (editor: Nicola Simmons). EDC Institute. Oct 17-18, 2016. The Changing Face of Higher Education: Implications for our work with faculty and their classrooms. Toronto ON. Hosted by Sheridan College, Humber College and the University of Toronto-Mississauga. 2016 Symposium on Scholarship of Teaching and Learning: Learning in and across disciplines. Hosted by Mount Royal University. Keynote speaker: David Pace. Nov 10-12, 2016. Banff Alberta.